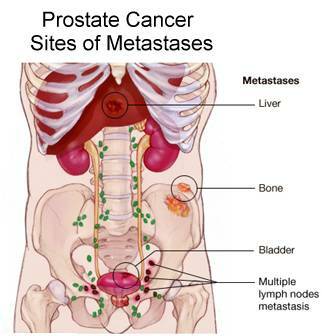 Radiation is often useful in cases where the cancer has already spread to another area (called metastases typical pattern for breast or prostate or lung as seen on PET). Even though the patient may not be cured, they may have a dramatic relief of their symptoms and live weeks or months (or even years) longer with radiation treatments. Some patients with isolated metastases in the liver or brain may still be cured.) Some data on survival is noted here. 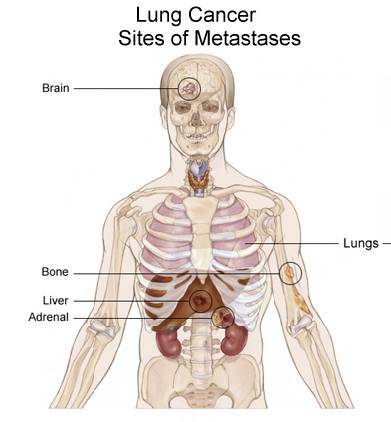 Some patients present with metastases without an obvious source for the origin of the cancer (referred to as having an occult primary.) There are certain patterns common to cancer spread (see here) and the NCCN has a protocol for evaluating people with an occult primary (go here.) 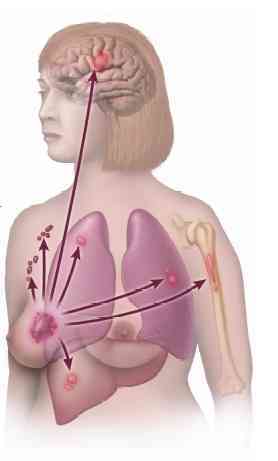 Chemotherapy for metastatic cancer is often used based on the type of cancer. Most of the metastatic adenocarcinomas of unknown primary probably originate from the lung, pancreas or colon and new genetic profiles may reveal the true source (see here). In some cases patients present with metastatic cancer from an unknown (or occult) primary, there is a general protocol as to certain chemotherapy regimens that are effective in this situation as noted in the study below. Since 1995, The Minnie Pearl Cancer Research Network (MPCRN) has performed five sequential phase II studies in a total of 396 patients with unknown primary carcinoma using several new chemotherapy combinations. Initially, paclitaxel (Taxol) was tested in combination with carboplatin (Paraplatin), and oral etoposide (VePesid) subsequently, docetaxel (Taxotere) was tested in combination with cisplatin (Platinol) and later with carboplatin. Patients with favorable prognostic features, known to be more treatable with better prognoses, were excluded from these studies. After a minimum follow-up of 4.5 years for the 144 patients in the first three studies, the median survival time was 10 months and the 1-, 2-, 3-, 4-, 5-, and 8-year survival rates were 42%, 22%, 18%, 16%, 12%, and 10%, respectively. 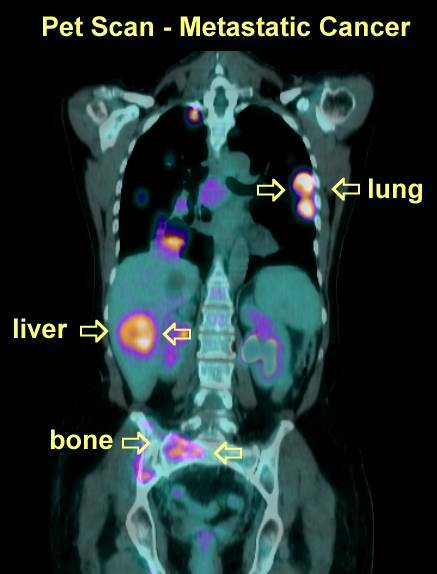 Gemcitabine (Gemzar), a drug with activity in several solid tumors, was also found to be useful as secondary therapy for some patients with carcinoma of unknown primary site. Subsequently, the combination of gemcitabine, carboplatin, and paclitaxel in the fourth study in 120 patients was found to be active, to be associated with acceptable toxicity, and to result in survival similar to our previous three taxane-based regimens for these patients. Recent clinical experience with irinotecan (Campostar), both alone and combined with gemcitabine, has been encouraging and relatively well tolerated as second-line therapy. Based upon these observations, we evaluated the feasibility and efficacy of first-line treatment with paclitaxel/carboplatin/etoposide followed by gemcitabine/irinotecan in patients with carcinoma of unknown primary site. We report here the results of this multicenter phase II study, conducted in the MPCRN. One hundred thirty-two patients were treated with sequential combination chemotherapy for a maximum of six cycles. All patients had relatively poor prognostic features. Fifty-nine patients had well-differentiated adenocarcinoma, 73 patients had poorly differentiated carcinoma, and 121 patients had performance status scores of 0 or 1. Results. Thirty-three (30%) of 111 assessable patients (95% confidence interval 27%33%) had objective responses to treatment (26 partial responses, seven complete responses). The combination of gemcitabine and irinotecan was associated with significantly less toxicity than the triple-drug regimen and improved the responses in several patients (10%). The response rates were similar in the two major histologic tumor types, but were lower for patients with liver-dominant tumors (13%) and higher for patients with lymph-node-dominant tumors (50%). The median progression-free survival time, median survival time, and actuarial survival rates at 1 and 2 years were 5.7 months, 9.1 months, 35%, and 16%, respectively. Conclusions. Sequential combination chemotherapy with paclitaxel/carboplatin/oral etoposide and gemcitabine/irinotecan is an active treatment for patients with carcinoma of unknown primary site, but overall toxicities are greater than those seen with other combinations of new drugs and survival appears similar to that observed in 264 other patients treated in our four previous phase II trials.